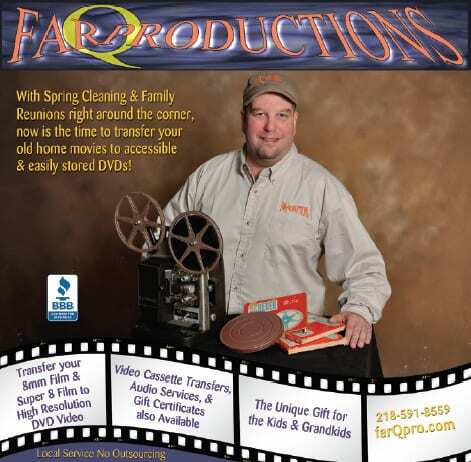 WELCOME TO FAR Q PRODUCTIONS, YOUR ONE- STOP SERVICE PROVIDER FOR FILM TRANSFER, VIDEO AND AUDIO SERVICES! 16mm, Super8 & 8mm FILM- TO- DIGITAL VIDEO TRANSFER SERVICES! Film transfer services have easily become the most popular request here at FQP. With many satisfied customers- and over 660,000 feet of transferred film- you'll find it hard to beat the attention to detail, professional quality, and pricing that are offered at Far Q Pro. Satisfied customers aren't often wrong; and repeat- business clientele speaks for itself! FQP's film transfer services yield true broadcast quality videos that feature better luminosity, color, and flickerless reproduction than you have ever seen from your films before! Don't let degradation or disaster deprive you of the precious memories that your home movies contain. . . transfer them to DVD and enjoy them for many more years to come! Please feel free to call with any questions you may have regarding film transfers, or any of the other services offered. Normal business hours here are 8:00am- 7:30pm, Central Time, Mon- Sat. Please leave a message if there is no answer, and I will gladly return your call. The "FILM TRANSFER INFO" and "FILM TRANSFERS" pages contain all of the information that you will need to get your project underway, including details regarding reel sizes and running times, pricing guidelines, and even some film history and technical specifications. There's even more information on the "FAQs" page, and as always if you don't find what you're looking for just get in touch directly via the "CONTACT" page. Transferring your home movie films is a great way to preserve your family history and memories, but it's also a wonderful and unique Holiday gift idea for family and friends! You'll be surprised at how affordable this service actually is- and you'll be amazed by the quality of your transferred films! SPECIAL DISCOUNTS OFFERED FOR VETERANS & MILITARY PERSONNEL! America appreciates the contributions made by our Servicemen & Servicewomen, and so does Far Q Productions! Please call or email for details regarding Military Discounts! FAR Q PRODUCTIONS IS ACCREDITED BY THE BETTER BUSINESS BUREAU OF MINNESOTA & NORTH DAKOTA! Please click the link below to visit the BBB website to verify our A+ rating and read customer reviews! NOW AIRING! THE VERY FIRST FAR Q PRODUCTIONS BROADCAST TELEVISION COMMERCIAL! Currently airing on Duluth, MN's WDIO Channel 10- 2 "METV" network, this 30- second spot features some very nice Super 8 film footage from 1972! Hosted by YouTube, just click the play- arrow. . . and enjoy! FAR Q PRODUCTION'S SECOND BROADCAST TELEVISION COMMERCIAL! Now airing on Duluth, MN's KBJR Channel 6- 1, this is another 30- second spot. It features more Super 8 film footage than the first ad, and some of it from even earlier years. This spot also includes an audio track of a Bell & Howell Super 8 Design 346A projector- the most popular optional audio track here at Far Q Pro! AS SEEN IN THE WOMAN TODAY MAGAZINE! The very kind and professional folks at The Woman Today magazine were interested enough in the details of Film Transfers that they published a nice article on the subject in their October/November 2011 issue. Please call or email for complete details on gift certificates. They're a great option for holiday gift- giving!